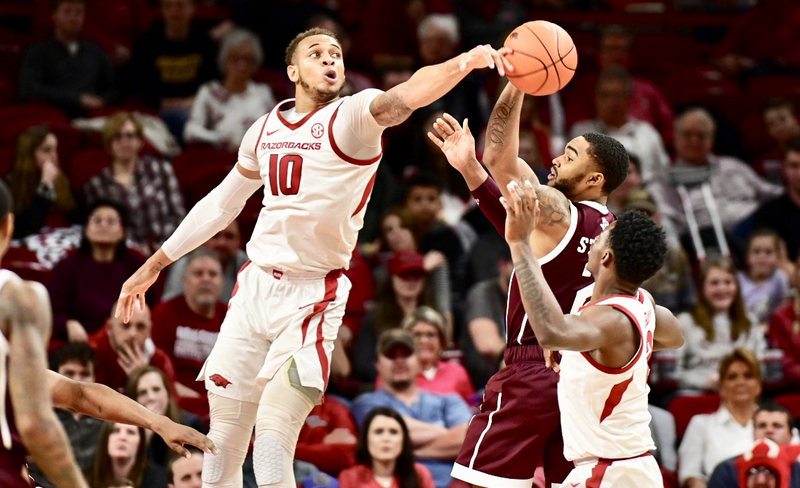 FAYETTEVILLE – Texas A&M used an 8-0 run inside the final five minutes to pull away from Arkansas and the Aggies held on for an 87-80 victory over the Razorbacks Saturday night at Bud Walton Arena. A tight game through the first 35 minutes, Arkansas was down three (67-64) with 4:42 left before the Aggies’ 8-0 run to take an 11-point lead with 2:28 left – the first double-digit lead of the game. The Razorbacks fouled down the stretch and got to within six twice but could not get any closer. Texas A&M out-rebounded the Razorbacks 35-25 and made 25 free throws on 34 attempts, compared to 15-of-21 by the Razorbacks. While Arkansas shot 47.6 percent from the field, A&M made 58.3 percent of its field goals. The Aggies were led by Savion Flagg and Wendell Mitchell. The duo scored 22 and 20 points, respectively, while Josh Nebo scored 14 and TJ Starks had 11. Daniel Gafford, who was 5-of-5 from the field in the second half, recorded his ninth double-double of the season, scoring 23 points and grabbing 13 rebounds. Isaiah Joe added 20 while Mason Jones contributed 11. Arkansas hits the road to face #4 Kentucky on Tuesday (Feb. 26). Tip-off at Rupp Arena is set for 8 pm (CT)/9 pm (ET) and the game will be telecast on the SEC Network. The first half was a back-and-forth affair through the first 12 minutes. Despite going over five minutes without scoring, Arkansas still led by three, 22-19, at the 8:41 mark. The drought ended with a put-back by Adrio Bailey and a lay-up by Gabe Osabuohien. Texas A&M, down five with 5:18 left in the half, went on a 13-0 run to take an eight-point lead (36-28) with 2:00 left. Isaiah Joe drained a 3-pointer as the shot clock expired to end the dry spell. Joe’s 3-pointer sparked a 9-0 Razorback run that included four free throws by Joe and two by Daniel Gafford to give Arkansas a 37-36 lead with 20 seconds left. The Aggies got a lay-up with three seconds left to put Texas A&M up one, 38-37, at the break. Isaiah Joe led Arkansas with 12 points and made two 3-pointers to tie Pat Bradley for fifth on the school’s single-single season list. Bradley made 93 3-pointers in both the 1998 and 1999 seasons. Up one coming out of the halftime break, Texas A&M scored the first bucket of the second half did not relinquish the lead. Arkansas worked its deficit to three (67-64) with 4:42 left before the Aggies went on an 8-0 run to go up 11, the first double-digit leads of the game. Arkansas’ starters were Desi Sills (G) – Isaiah Joe (G) – Jalen Harris (G) – Daniel Gafford (F) – Gabe Osabuohien (F). It is the first time for this starting five. Desi Sills and Gabe Osabuohien earn their first respective starts. Arkansas won the opening tip. Desi Sills scored the first points of the game, a 3-pointers off a Gabe Osabuohien assist at 19:04. Texas A&M is Arkansas’ most common opponent, and this was the 159th meeting between the two schools. The rivalry dates back to Arkansas’ first season of basketball – 1923-24. Arkansas leads the all-time series 103-56, including a 57-14 advantage in games played in Fayetteville. Since the Aggies joined the SEC in 2012-13, Arkansas holds a 7-5 advantage, including a 73-71 win in College Station to start SEC play this season (Jan. 5). Daniel Gafford had his second-best career rebounding effort, getting 13. Gafford and Joe combined to collect 19 of the team’s 25 rebounds. Mason Jones had a team-best four assists. It was the eighth time he has led the team in assists.